The weather may not be so nice at the moment, so if you're looking to fake that coveted sun kissed glow but don't want to use fake tan, Nourish's Golden Glow Toning Body Shimmer is a cracking alternative. 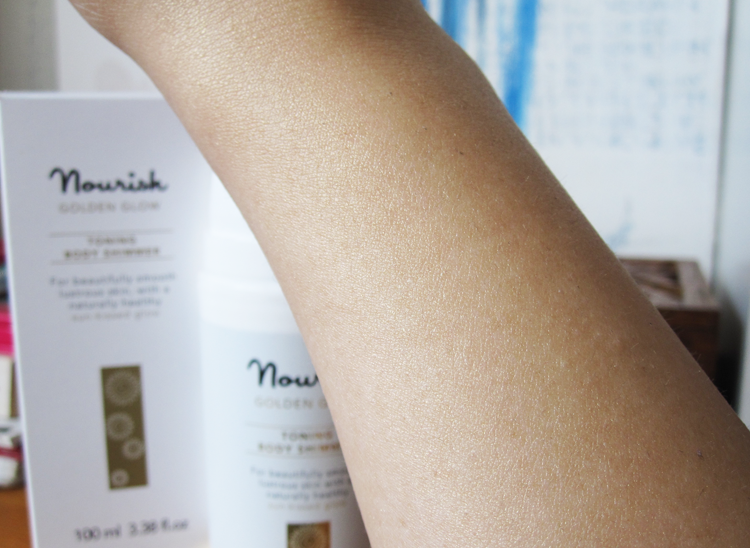 I love the whole 'glowy, healthy skin' look, so I've been reaching for a helping hand in the form of Nourish Golden Glow Toning Body Shimmer. The eagle eyed amongst you may already know this product in its previous 'Golden Glow Toning Souffle' form, but it's now been repackaged into a handy pump dispenser bottle which is much more travel friendly and easier to apply. As the name suggests, this is indeed a body shimmer but one that is packed full of skin friendly ingredients such as Phyto Active Marine Extracts which help to firm and tone the skin. 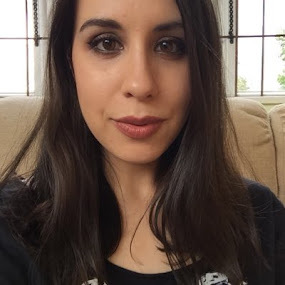 I'm always dubious about the claims of toning body products but this does help to give the impression of more toned skin which is always a good thing! On top of this, it also features Hyaluronic Acid, Myrrh and Argan Oil to hydrate the skin and keep it silky soft and is fragranced with Neroli Oil which is one of my favourite scents. And the shimmer? The shimmer is GORGEOUS! There are lots of tiny light-reflecting particles which all get together to work their brightening, glowy magic onto the skin. The effect is wonderfully subtle (you're NOT going to look like a disco ball, I promise!) and definitely helps you fake that sun kissed, glowy, healthy skin look. 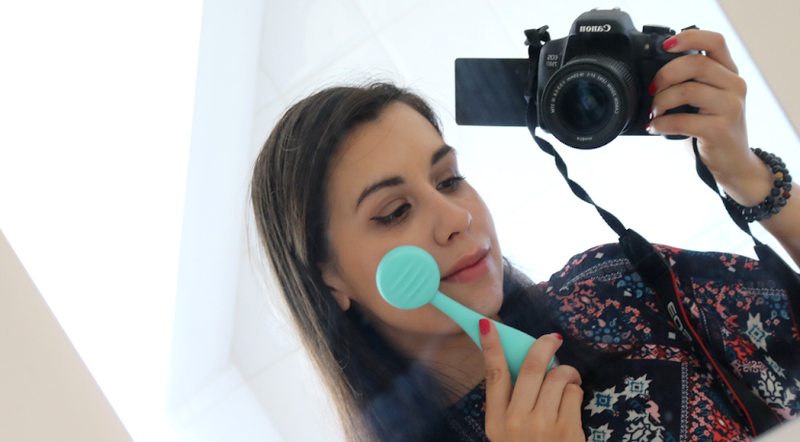 I'd recommend this for anyone who wants to fake that coveted glow for an evening / night out or to top up a tan whilst on holiday as it can be used all over the body. 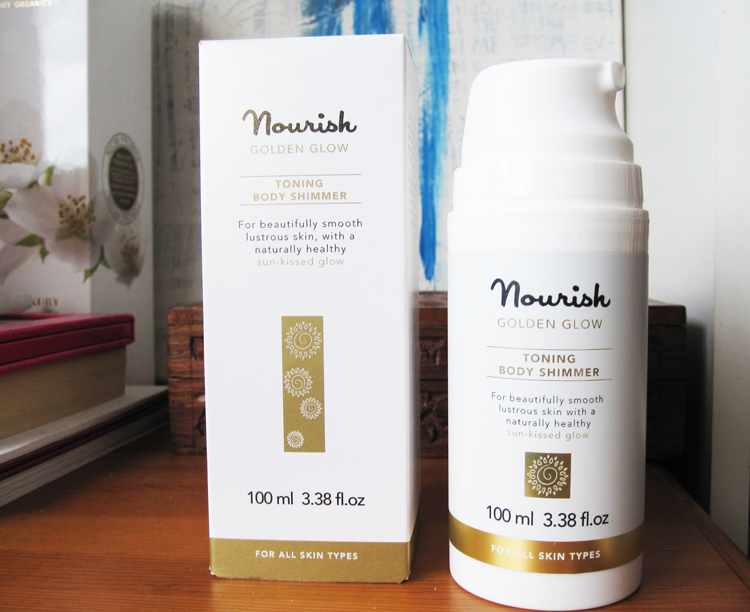 Nourish Golden Glow Toning Body Shimmer* (100ml, £25) can be purchased direct from shop.nourishskinrange.com / Nourish are vegan friendly, cruelty free, made in the UK and use organic ingredients accredited by the Soil Association. 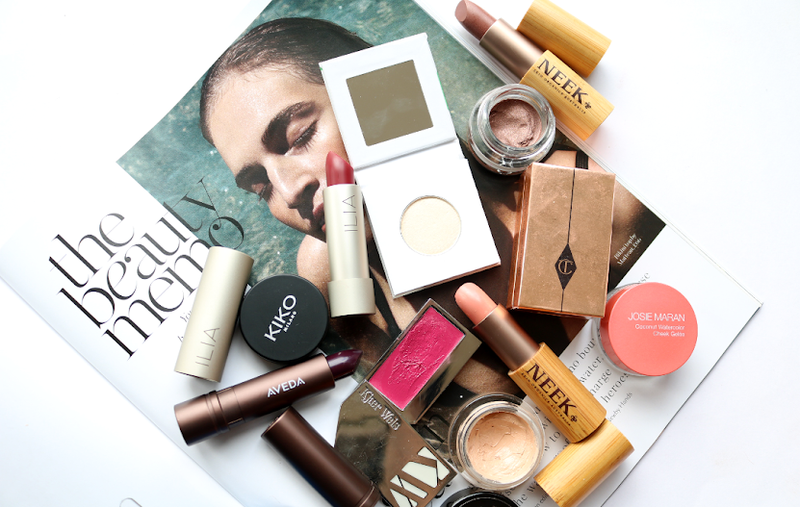 Are you a fan of body shimmers? This looks really nice, i like how it gives a really natural glow to the skin.